While there are a handful of sheesha houses down Hindley Street in the city, there’s still a demand for them, particularly on a Friday or Saturday night. The latest one to open is Lava Sheesha and Kebab House. Like most of these places, you can smoke your sheesha and have something to eat at the same time. 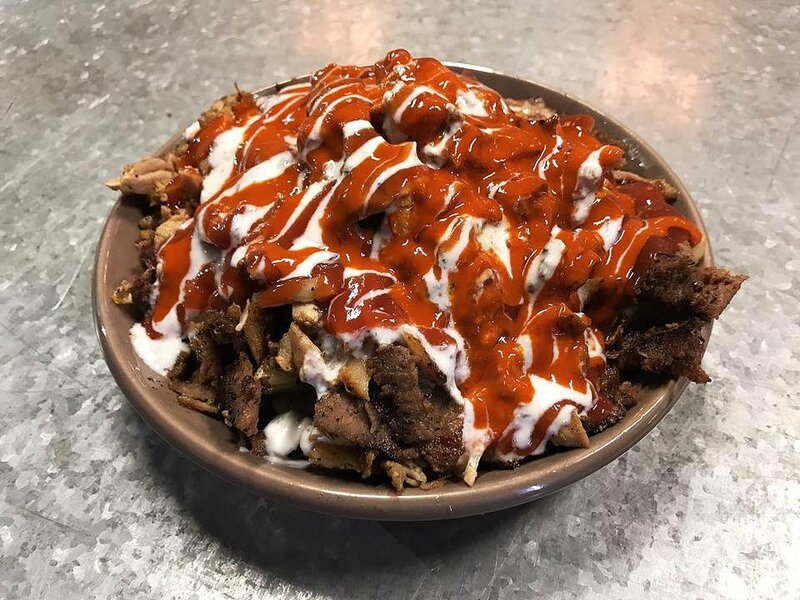 This place offers many of your middle eastern street food options as Yiros, Falafel, Spuds, Pides, Kebabs, Burgers and ABs. Tonight, I went for the Combination AB, which was a mix of chicken and a lamb/beef combination. The dish came out within 10 minutes of ordering and was generous covered in hot chilli, garlic and tomato sauce. The meat was taken off the rotisserie and quickly grilled to ensure it was cooked. It was juicy, succulent and well seasoned. The layers of meat was impressive, so much so, I could hardly find where the chips were. Deep down in the bottom was a single layer of chips, although they were slightly under cooked for my liking. The garlic sauce had good punch and the chilli sauce certainly packed a bit of heat. Lava Sheesha and Kebab House has some friendly staff who will assist you in what you want. Pricing for the food is what you’d expect with the large AB setting you back $15. Atmosphere is laid back and vibrant on a Saturday night. If you love plenty of meat in your ABs, this place is for you. Could work on the chips though.